(3) Some undifferentiated lymphocytes are processed, probably within the bone marrow, to become B cells. 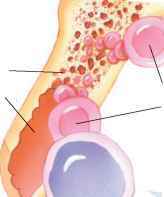 Bone marrow releases undifferentiated lymphocytes, which after processing become T cells (T lymphocytes) or B cells (B lymphocytes). Note that in the fetus the medullary cavity contains red marrow. 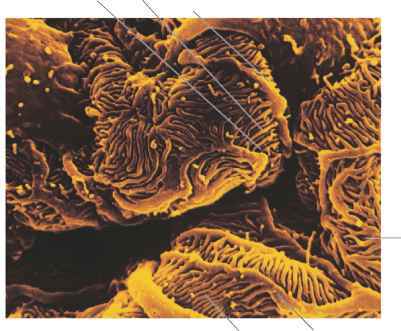 an organ in the chicken where these cells were first identified.) The blood distributes B cells, which constitute 20% to 30% of circulating lymphocytes. B cells settle in lymphatic organs along with T cells and are abundant in lymph nodes, the spleen, bone marrow, and intestinal lining (figs. 16.16 and 16.17). ^9 What is the difference between an antigen and a hapten? ^9 How do T cells and B cells originate?